The Sota Instruments cold corona water ozonator is an essential part of a complete wellness program and is the result of several years research and development. This is a true 200mg. per hour ozonator that is built to last a lifetime. Ozonating your drinking water is a fast and safe means of neutralizing germs, pathogens, chemical residues, pesticides, pharmaceutical residues and adding more beneficial oxygen to your body. It takes only a few minutes to produce a pure, refreshing glass of ozone water! With the concern of food-borne bacteria, many people give their fruits and vegetables an ozone soak in a basin of water to reduce the presence of various contaminants. As an added bonus, fruits and vegetables stay fresher and crisper. Time periods to saturate the water will depend upon size of your container. You can not over-ozonate the water as it will only absorb so much ozone. It is not possible to introduce harmful levels of ozone into your drinking water. Most ozonators use internal components, metals, plastics, etc. that will break down from the corrosive effects of the ozone moving through the reaction chamber and tubing. This contributes to premature failure of the device and more importantly, it can introduce small amounts of contaminants into your drinking water, such as Oxides of Nitrogen (NOx). 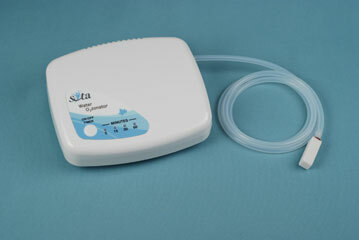 The Sota Instruments water ozonator utilizes the highest quality materials available, some of which are medical grade. According to laboratory testing, there are virtually zero Oxides of Nitrogen produced by the Sota water ozonator. The ozone reaction chamber is made from the purest quality Fused Quartz Crystal (99.995% pure quartz). The tubing is an ozone-resistant Silicon Air Tubing that will not harden, crack or kink. The ozone outlet connection is made of strong stainless steel, where other companies use plastic. Even the Ceramic Air Stone uses a medical grade Kynar material for the air inlet pipette. All of this attention to detail means that you can expect many years of trouble-free performance, while enjoying the benefits of pure, oxygenated, sterilized water. Please note that we do offer other water ozonators for sale, but we have not sampled any other product with the high quality standards of the Sota Woz-5. This is not an exaggeration! The ozone coming from the Woz-5 aerator stone has a "sweet" smell to it....just like nature produces. Even the taste of the ozonated water is different from other ozonator brands. The Woz-5 water is very refreshing and the taste is not offensive or bitter as in other ozonated water we have sampled. Sota Ozonator has a two year warranty and a limited 30 day money back guarantee. If the unit is returned unused within the first 30 days, there is a full refund (not including shipping charges). If the unit has been used, the 30 day refund is subject to a 10% restocking charge to cover replacement of accessory parts. In the event the link is not active, call Sota at 800-224-0242 and give the operator your Referral Number CA50025. You can pass this Referral code along to your family and friends and they will also receive the 5% discount on their first purchase. Sota will process your credit card and ship the items directly to you from Canada. Charges will include item amount & shipping. Sota Instruments ships to the U.S. and Internationally by Canada Post. Rates are subject to change without notice due to the rapid changes in fuel and transport costs. Option 2 - order directly from Transformation Technologies from U.S. supplier. No retail discounts are available with this option. Note: the opinions stated are the views of Transformation Technologies and do not represent the opinion of SOTA Instruments. The SOTA units are classified as Consumer Products designed to be used as part of a Wellness Lifestyle. The SOTA units are not medical devices nor are they intended to diagnose, treat or cure any medical or health condition. The use, safety or effectiveness of the SOTA units, has not been approved by any government agency. Please consult a health practitioner for any medical or health condition. Results are not typical.